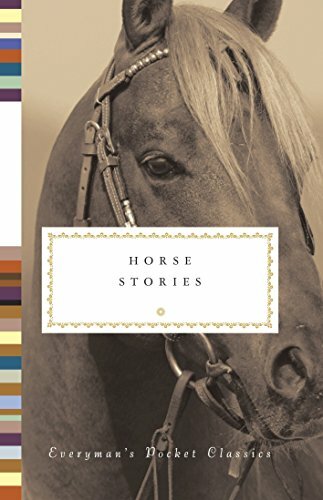 This book is exactly what it appears to be: A collection of horse stories written by a Who’s Who of literary stars over the past century. It’s part of the Everyman’s Library Pocket Classics series, which includes Cat Stories, Dog Stories, and the like. The 20 short tales portray horses themselves; or people who have horses; or horses as motifs, themes, and symbols. Whether the collection works for you depends on the degree to which you’re a horse lover or a literary short story lover (or both). Horse lovers will be disappointed to find that the majority of these stories are human character studies with horses in the background. They range from short-shorts by Saki, Isaac Babel, and Annie Proulx to longer, more complex stories by Bret Harte, Damon Runyon, J. D. Salinger, William Saroyan, and Margaret Atwood. A few stories are presented through the horse’s eyes, such as Rudyard Kipling’s “The Maltese Cat,” wherein a team of polo ponies does the actual game playing, with their riders as passengers; and Jane Smiley’s “Justa Quarter Crack,” about a racehorse on hiatus for an injury and the strange little woman who takes care of him. These are the most engaging stories, and will resonate with horse lovers. Likewise with Lydia Peelle’s “Sweethearts of the Rodeo” and Pam Houston’s “What Shock Heard,” in which characters live a horsey lifestyle and have transformative adventures (or misadventures) in the saddle. In some cases the story is actually a book chapter; for instance, Smiley’s “Justa Quarter Crack” is from her novel Horse Heaven; and “The Gift,” by John Steinbeck, comes from his tragic coming-of-age classic, The Red Pony. The book itself is a beautiful, pocket size, hardbound volume with an artistically horsey cover jacket, quality paper, and a ribbon bookmark—ideal for travel or leisure when a taste of thought provoking entertainment suits a free moment or a mood. It doesn’t waste pages with introductory or background material—just plunges right in, with a list of sources and copyright information at the end. In all, it’s an excellent addition to the serious reader’s home library as well as a welcome gift to readers and horse lovers alike.